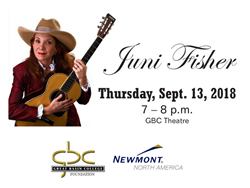 The Great Basin College Foundation, in part with Newmont present western and folk singer-songwriter Juni Fisher, Thursday, September 13 at 7 p.m. in the GBC Theatre. Born in the San Joaquin Valley of California, Fisher spent her early years training horses, as well as working on cow-calf operations. She now tours the country full time, delighting audiences with her original songs, storytelling, and guitar playing. In 2013, Fisher celebrated the release of her seventh album titled, “Listen…to the Horse” which won 2013 WMA song of the year. Cowboy poet Waddie Mitchell says: "Juni Fisher is the best thing to happen to western music in a long time." Her awards include: True West Magazine Best Solo Musician, 2012, 2017, 2011 WMA Entertainer of the Year, 2006, 2009 & 2011 WMA Female Performer of the Year and many more song, album, songwriter of the year awards. 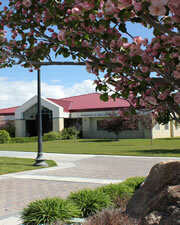 Admission is $5 for students and seniors and $10 for the general public. Tickets will be available for purchase at the event.